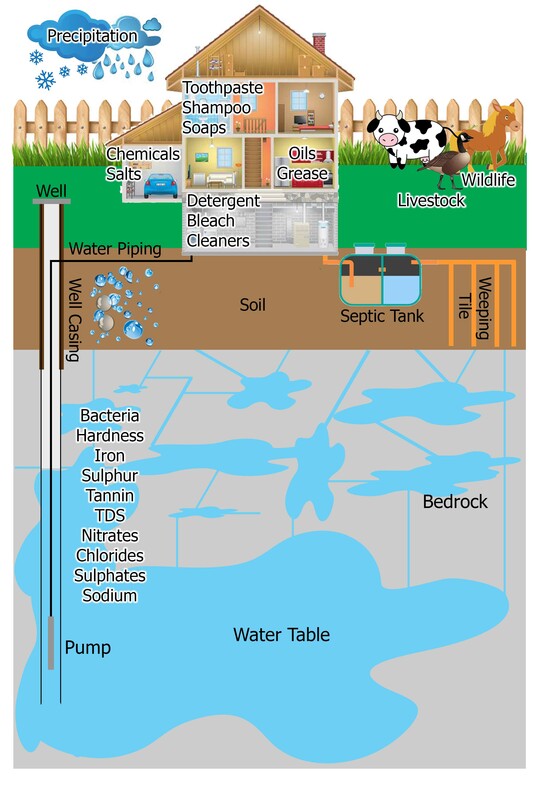 Have you ever considered what might be in your well water? Cleaning products, detergents, soaps, cleaners, shampoos, pharmaceuticals, grease, oils and variety of other household contaminants can enter the water supply. Rural household drains transport materials to the septic system. The septic tank is designed to leave solids in the first chamber and liquids in the second chamber which then flow to the weeping tile and into the soil surrounding the system. Water hardness (white scaling), Iron (orange staining), Sulphur (rotten egg smell), Tannin (coloured water), Total Dissolved Solids (TDS), Sulphate, Chlorides and Sodium can be present in varying levels in well water. Coliform can exist naturally in water. E. Coli is from human or animal feces and can also be contributed by wildlife, pasturing and septic systems with the right conditions. Ensure that your well is properly sealed and that no materials are stored in close proximity. Improper wellheads can allow water from the surface deep into the ground. Not all Water Tests are Equal! Homes located side by side, each with a well and septic system in the country have greater risks for water contamination. These types of subdivisions are common in rural areas as the population is not large enough to have municipal water and sewer services. This is also particularly important for older homes as aging septic systems can contribute to water quality as they degrade.